Lips are a central feature for Valentine’s Day. OK, let’s be real here. Lips are a central feature that we play up with makeup all day, every day. They just get a little more attention during the lover’s holiday since you will likely be doing some additional smooching. The best way to play lips up is with Hard Candy’s Plumping Serum Lip Gloss, which is now available in an array of irresistible new shades. The formula causes a minor tingle on the pucker when applied, with no scent or taste. The plumping action and the sting are slight; you will easily be able to withstand it. Love Child is the essential shade in the new extension. It’s a light purple gloss and the combo of the pigmentation and the mega wattage shine make lips appear fuller and more voluptuous. 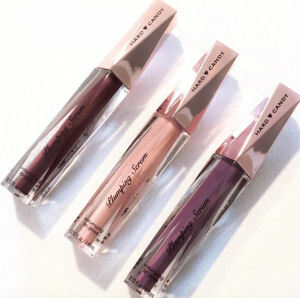 If you are beyond over the ultra precise, mega matte trend and need a little gloss in your life, Hard Candy’s Plumping Serums will do the trick. Pucker up and pout away…plumply.